Future Librarian Superhero: Milk Carton Igloo! So cute I have to share! 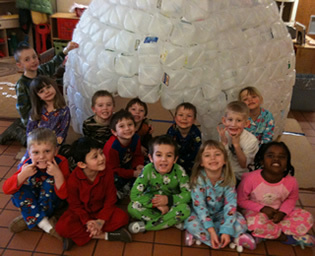 The 4K class that I visit twice per month made this amazing igloo in their classroom out of milk jugs! Today I had storytime there and I stopped by their room afterwards to see the igloo. Being a lover of tiny hidden places I, of course, crawled inside--much to the starstruck delight of the three littles already in there. The girl said to one of the boys, "The library is in here!" and then they all giggled. When I asked them a question, they all giggled like they were talking to a celebrity and were too shy to answer. Way to make a fairly cranky day more delightful, kids. What a cool project (no pun intended)--and they incorporated the project into math, science, and social studies as well. Bravo to those teachers. I love how kids are in awe of their librarian superheroes. People so totally don't understand how amazing the feeling is. Librarians + kids+ igloo = amaaaaazing!